Founded in 1613 for the nuns of Les Minimes, this delightful former convent was opened in 2008 after total renovation and transformation into a modern luxury hotel fitted with state of the art features yet retaining the textures and ambience of the ages. A place to restore one's soul and body from the cuisine to the restful gardens, from the l'Occitane Spa to basking in the sun by the pool. 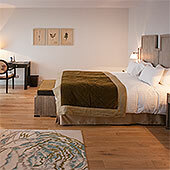 A good base to explore this region that is filled, like Le Couvent, with centuries of history. 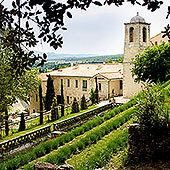 Opened as a hotel in 2008, "Le Couvent des Minimes Hotel and Spa", former home of the Minimes nuns. This recently restored and beautifully converted building is located in the otherwise ordinary country village of Mane just outside of Forqualquier the county seat. "Le Couvent" is set in lovely and tranquil gardens some of which step up the hill in ancient terraces. It is a delight to the soul to meander through this atmosphere of genuine peace and harmony that has been bringing tranquility to souls for many centuries. Strolling among the fragrant plants and graceful pathways, whether you follow the winding hillside path of the stations of the cross or across flat land, you find yourself completely letting go of life's stresses and difficulties. To further enhance this well-being, is a Spa by L’Occitane which is very well-equipped with treatment rooms, massage, beauty treatments and more as well as their own indoor pool and featuring the excellent products of L'Occitane (manufactured just a few miles away near Manosque home of Jean Giono). 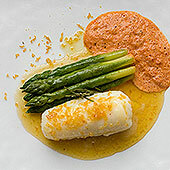 Also the cuisine of chef Jerome Roy of the hotel's restaurant "Le Cloître" provides an inner pleasure as well as a treatment to the taste buds. "Le Cloître" is extended onto a delightful covered patio, where you can sample the wealth of the Mediterranean in caramel-colored armchairs with white cushions. In summertime too, you can enjoy a light lunch beside the pool in the " Bancaou" bar-restaurant. The 46 luxurious rooms and suites follow through with the furnishings and soft Mediterranean colors adding to a sense of well-being. Despite hosting WiFi, flat wide screen TV, and many other modern electronic aids that have become indispensable, the rooms are still heavily steeped in history. They were remodeled to combine the charm of convent's history and the serenity of the site with the comfort of a very special place. This new addition to the Relais & Chateaux group, opened in 2008, will be a welcome gift to the region especially since it is open all year and is the only luxury hotel and spa in the area. This region is due east of the now famous Luberon grouping of villages that includes Gordes, Rousillion, Bonnieux, Menerebes and Apt. Forqualquier and Mane are slowly gaining in note as they have not been trampled by the hoards of tourists that their more famous cousins have been. Instead, it has a more authentic, self sufficient provincial town famed for the company that makes arguably the best Pastis in the world, and now also the home to "Olivette" a boutique manufacturer of specialty olive oils from the former owner of L'Occitane. It was also the summer home of Pierre Boulez the well known conductor. The Spa at Minimes is built around the pure products of L'Occitane. Created 30 years ago, L'Occitane has become one of the leaders in natural cosmetics. The group produces its entire range in its Manosque factory. In 2007, the brand was present in 85 countries with around 900 shops, including 110 in France.